It is to the brothers Richard and Alan Jensen, training engineers, that we owe the creation of the eponymous brand, after joining their know-how with the Smith bodywork based in West Bromwich in Great Britain. Since the end of the Second World War, having worked for the largest English manufacturers, Jensen resumed the construction of cars in his name, marking his orientation to the segment of the high end thanks to the particular care given to his achievements. The designer Eric Neale is recruited and signs the first Interceptor in 1950 and some masterpieces like the Jensen 541, in 1955, which was distinguished by its original body fiberglass and four feins discs. Finally, he was responsible for the C-V8 in 1962. Meanwhile, Jensen continues to work for other manufacturers, like the Volvo P1800. His hour of glory will finally ring with two models quite remarkable: the Interceptor and the FF. 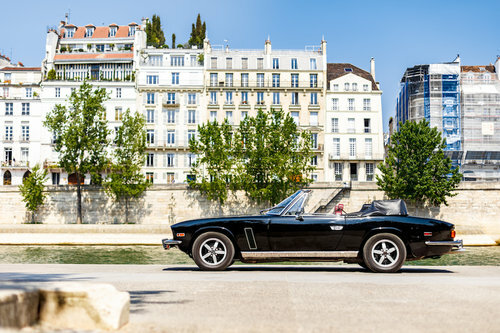 When the time to replace the CV8 came up, Jensen appealed to the outside and asked for a proposal at the Milan Carrozzeria Touring. But unable to provide the quantities requested, Touring had to leave the realization of the elements of the steel body in Vignale. These were initially mounted on the chassis directly in Italy but Jensen's quality requirements would soon compromise the partnership. All production was repatriated to England at the Jensen factory in West Bromwich where the stamped and painted panels arrived in Italy. 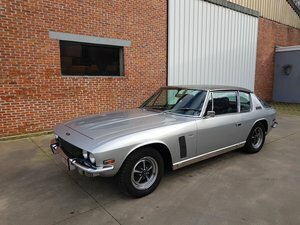 The Jensen Interceptor was born in 1966 at the Earl's Court Motor Show, one year after the presentation of the P66 prototype. During its presentation, the MKI interceptor is driven by a 3307v 627cc Chrysler V8. 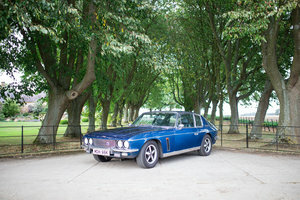 Like many cars of the time, the Interceptor will evolve over time. The Mk2 will be presented in 1969, with a modification of the braking and the front suspension in particular. In October 1971, Interceptor III (Mark 3) was launched in parallel with MS. 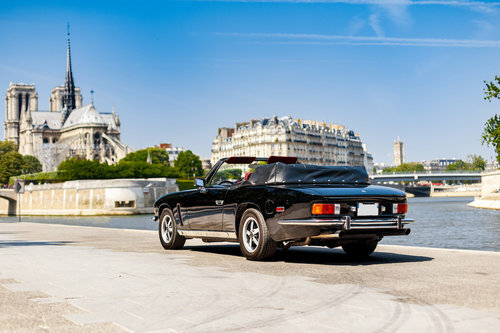 The MkIII, first series, takes all the internal and external evolutions of the SP with the exception of the V8 which remains the Chrysler 383 ci. This model is characterized by its new GKN alloy wheels. The old 383ci V8 castrated by pollution standards now allows to get out just over 300 hp with a compression ratio of 8.7: 1. 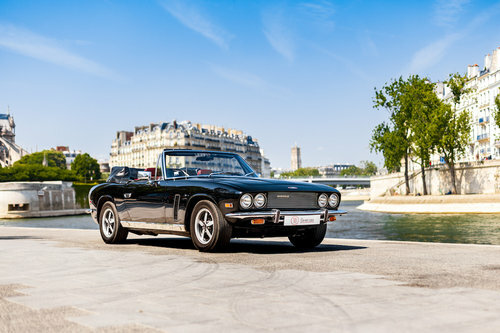 It will however be the only offer until May 1972, when it was replaced by Chrysler by a low compression version (8.2: 1) of its V8 440 type RB to counter the decline in power. 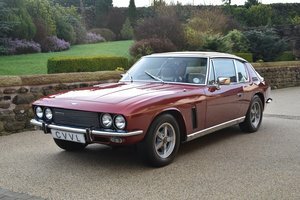 Visually identical to the Mk III, the Interceptor III series 4 (and 5) launched in October 1973 will represent for many the golden age of the model, having reached a peak in its development. This new version adopts many modifications under its dress, starting with the Chevrolet V7 7L2 engine that can raise the power to 285 hp. In addition to the "J" logo on the back, a deep redesign of the interior is made with the replacement of plastic dashboard elements molded by leather and burr walnut (previously in option) much more rewarding. In March 1974, a convertible version (convertible) of the Interceptor made its appearance. 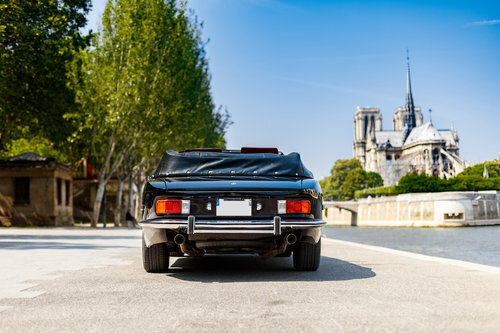 Despite her overweight caused by many structural reinforcements and her hydraulic opening hood, she was accelerating as fast as the coupe version. The cabriolet version will be marketed to less than 300 copies. The proposed car is a 1975 Interceptor Cabriolet. Delivered new in the United States where it remained until it was imported to France in 2016. 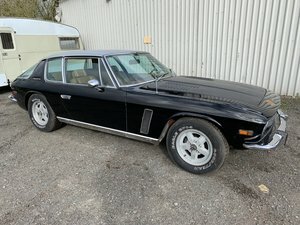 This Jensen has the distinction of having a very important restoration file, almost 2 binders Invoices and details of the restoration are delivered with the auto. This restoration was carried out between 2008 and 2012. The car is in excellent condition. The alignments are very good. The painting is of good quality and well tense. A protective ceramic treatment has been applied to the car. The engine starts a quarter turn without abnormal smoke. We drove under a significant temperature in the city, the car does not take temperature. An electronic igniter of type MSD is installed on the car. The 3-speed automatic gearbox works perfectly without slowness or snags. 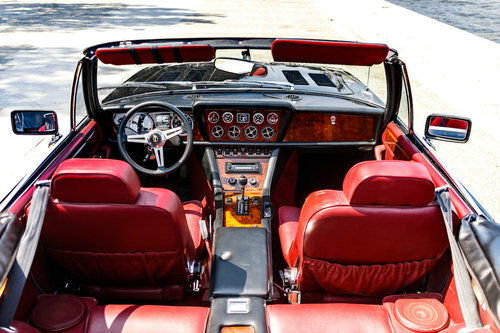 The interior is impeccable. The leathers are absolutely not marked. A high-end Hi-Fi installation was installed during the restoration with McIntosh amp, pre-amp Diamant, Nakamichi car radio. The hood is in perfect condition, the hydraulic mechanism works quite normally. The car is visible by appointment at our premises. 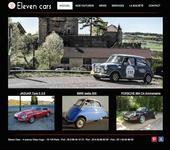 Photo Credits Kevin von Campenhout for Eleven Cars.